Treasury Secretary Timothy Geithner's career in public service is probably nearing its end, if recent media reports are right. Heck, some critics have been calling for his resignation for at least the past two years, and many Americans were annoyed by his appointment in the first place, after it was revealed that he neglected to pay $35,000 in self-employment taxes while working for the IMF (and improperly deducted the cost of his children's sleep-away camp as a dependent care expense). As Geithner mulls his career options -- along with book deals and speaking engagements -- the Obama administration will have its hands full finding its next Treasury secretary. It may be the most important decision the president will make ahead of the 2012 election. No doubt it is a difficult job. Treasury secretaries need to be smart enough to understand the nuances of fiscal and monetary policies, yet savvy enough to be able to communicate this information to people who would rather gouge their eyes out with a rusty fork than think about economics. Add in the poisonous partisanship in Washington, and the list of Geithner's replacements is surprisingly short. Nonetheless, I have cobbled together a list of potential Treasury secretaries who are both qualified and able to get approval from Congress. Many of them are not economists by training. I have no idea if my honorees are even interested in the job. Below is the list, in no particular order. 1. Jack Welch, former General Electric (GE) CEO, is arguably one of the best CEOs of the 20th century. Welch transformed GE from a sleepy conglomerate to a worldwide economic powerhouse during his tenure from 1981 to 2000. The economy needs a swift kick in the rear, and Welch could be just the person to deliver it. His enemies called him "Neutron Jack" because he slashed tens of thousands of jobs by selling underperforming businesses and trimming the fat in others. Wall Street liked Welch's style, pushing the market value of the Fairfield, Conn.–based company from $14 billion to $400 billion. Welch, who is a Republican, is known for his blunt style, which might turn off some members of Congress. 2. Alice Rivlin has qualifications that few Treasury secretary candidates can match. Rivlin was director of the Office of Management and Budget during the Clinton administration. She also was a vice chair of the Federal Reserve. Though a staunch Democrat, Rivlin is also widely respected by Republicans. As a member of the president's bipartisan debt commission, Rivlin pulled no punches arguing in 2010, "Without a radical shift in policies, the gap between spending and revenues will continue to widen even after the economy recovers from the recession, as the baby boom generation retires, people live longer, and the cost of medical care continues to escalate." 3. Jamie Dimon, cantankerous Wall Street titan and CEO of JPMorgan Chase (JPM), doesn't suffer fools easily. He is unafraid to buck the conventional wisdom, such as when he canceled a $5 billion outsourcing deal with IBM in 2004, figuring the bank could perform the work cheaper itself. Dimon would be able to deflect Tea Party critics of the Wall Street bailout by arguing that his bank neither wanted the money nor needed it. 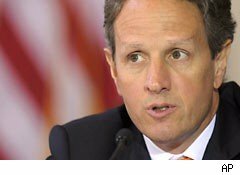 Some pundits had predicted that Dimon would get the Treasury secretary job that went to Geithner. 4. Anne Mulcahy, former Xerox (XRX) CEO, rose through the ranks to take the helm of the venerable company in 2001, when many investors had written off the company as a basket case. Under her leadership, Xerox overhauled its product line and created a services business that generates $3.5 billion in revenue. She was reportedly considered as a replacement for Larry Summers, former head of the National Economic Council. 5. Lindsay Graham, U.S. Republican senator from South Carolina, has broken with the GOP over taxes, arguing that some corporate tax loopholes need to be closed to restore sanity to the U.S. economy. Graham is almost certain to face a challenge from the Tea Party in 2014, since he has argued that their anger is unsustainable. Appointing Graham would send a strong bipartisan message that the economy is not a Republican vs. Democrat problem. 6. David Cote, CEO of Honeywell (HON), is a Republican with close ties to the Obama administration. He was a member of the president's National Commission on Fiscal Responsibility and Reform and is an advisor to Kohlberg, Kravis & Roberts (KKR) and a member of the board of JPMorgan. Under Cote, Honeywell has ratcheted up its corporate contributions, according to The Wall Street Journal. 7. Warren Buffett, the Berkshire Hathaway (BRK.A) CEO, probably wouldn't be interested in a career in public service at this point in his life. But appointing him Treasury secretary is not as far-fetched as some may think. Buffett is a Democrat who has repeatedly argued that taxes are too low on the rich. Imagine Buffett butting heads with Rep. Ron Paul, R-Texas, and members of the Tea Party. It would be entertaining to say the least. These are my picks. Let me know what you think in the comments below. Motley Fool contributor Jonathan Berr has no position in the stocks listed. The Motley Fool owns shares of JPMorgan Chase and Berkshire Hathaway. Motley Fool newsletter services have recommended buying shares of Berkshire Hathaway. The Motley Fool has a disclosure policy.